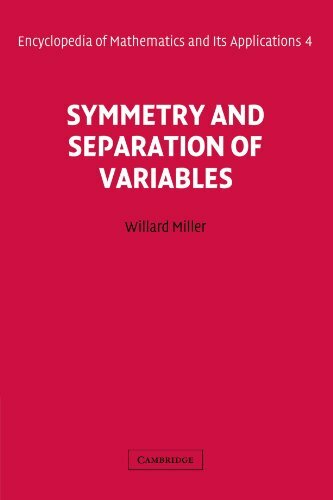 Originally published in 1977, this volume is concerned with the relationship between symmetries of a linear second-order partial differential equation of mathematical physics, the coordinate systems in which the equation admits solutions via separation of variables, and the properties of the special functions that arise in this manner. The purpose of this course was to introduce students to the applications of Fourier analysis -- by which I mean the study of convolution operators as well as the Fourier transform itself -- to partial differential equations. A Cauchy problem in mathematics asks for the solution of a partial differential equation that satisfies certain conditions which are given on a hypersurface in the domain. Cauchy problems are an extension of initial value problems. This course aims to make students aware of the physical origins of the main partial differential equations of classical mathematical physics, including the equations of fluid and solid mechanics, thermodynamics, and classical electrodynamics. This easy-to-read book introduces the basics of solving partial differential equations by means of finite difference methods. Unlike many of the traditional academic works on the topic, this book was written for practitioners.